This very special pattern contains 10 pattern pieces which may be combined to create an entire wardrobe of 18th century jackets. Four views are given, each for a different time period. Because all the pattern pieces, i.e. 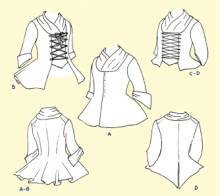 sleeves, cuffs, backs and front, fit together, you may create additional styles, based on your research.